Taisan oil pump. 240 volt. Model MLR35 suitable all Snugburner versions including those fitted to Rayburns. The original Taisan oil pulp was a MLR45 but the makers introduced a slightly different model, the MLR35. 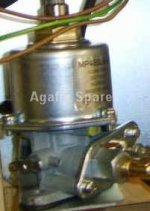 Although identical to look at it's happier at the pump pressure we recommend on our Snugburners fitted to Aga range cookers and Rayburn OF7's, i.e. 85psi. IMPORTANT please Do NOT shorten neutral lead as there is a resister built into the cable.